chili | poor scientist. will blog 4 food. I don’t make official New Year’s resolutions, but I suppose setting goals is useful no matter what the date on the calendar says. One thing that TC and I are focused on for 2012 is moving towards a healthier, whole foods diet (i.e., not processed), and making vegetarian meals whenever possible. As part of this endeavor, we’ll be getting a bi-weekly CSA box from Eatwell Farms. There were several motivating factors. First, even though it’s not necessarily the most cost-effective way of getting produce, we think it’s important to support local organic farms. Buying a CSA box is more than just getting a box of produce; it’s showing your financial and moral support for sustainable practices. Second, we had the opportunity to hear Nigel Walker, the owner of Eatwell, speak at a round table discussion and we agreed with what he had to say about his farming philosophy. In fact, Nigel made such an impression on TC that a man crush was born that night. 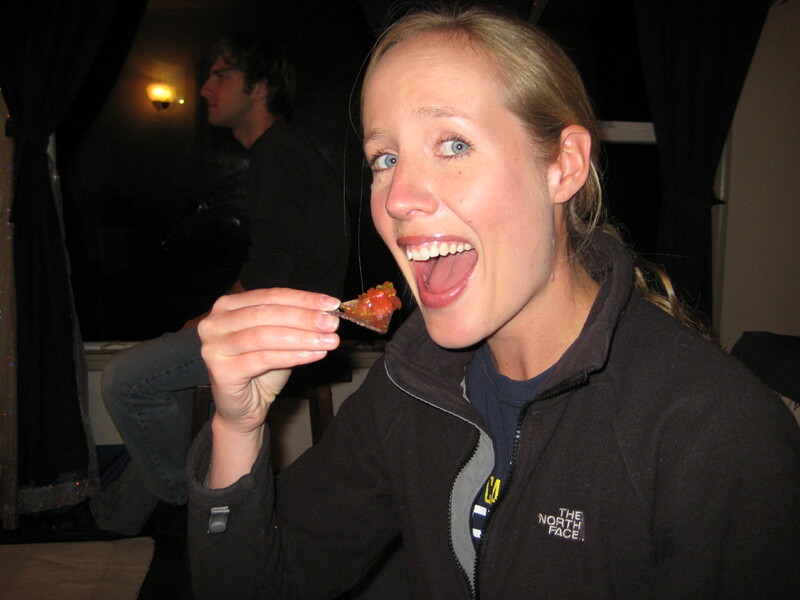 (The delectable eggplants, tomatoes, and peaches served after the talk also made quite an impression.) Finally, the CSA box confines you to cook what’s seasonal, and will thereby force me to diversify my cooking repertoire. It’ll be a challenge for sure! Anyway, we’re looking forward to it, and I’ll keep y’all updated on our CSA experiment as it develops. For this first day of 2012, TC and I were looking for something healthy to help us recover from holiday overindulgence. We decided to make the Red Lentil Thai Chili from Post Punk Kitchen (thanks to JN for the blog suggestion). We made this same recipe less than 2 weeks ago for a mini dinner party with our friend CN, and it was so good we wanted to have it again. Red lentil Thai chili - not too pretty, but super delicious and healthy! 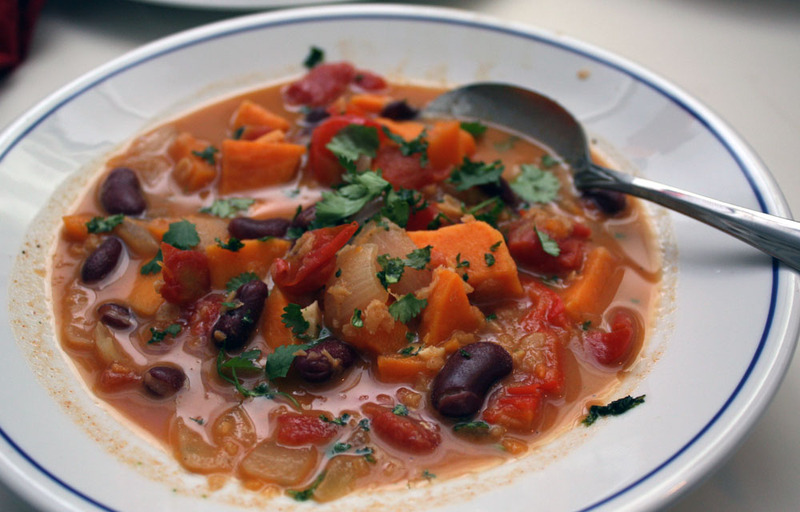 What’s awesome about this recipe is that you totally forget (and don’t care) that it’s vegan. It’s very hearty — we both love the sweet potatoes, while the coconut milk and red curry add a unique flavor and richness. The second time around, I added one chopped Serrano pepper and generous amounts of lime juice which were both great additions. It’s also pretty easy — after the chopping prep, the whole thing only takes about 30 minutes to cook. Finally, it makes a massive amount of food, which is always nice because I love leftovers. Do you have any resolutions or goals, eating or otherwise? Categories: cooking | Tags: chili, CSA, Eatwell Farms, goals, Post Punk Kitchen, sweet potatoes, Thai, vegan | Permalink. Like a lot of people, the cold weather makes me crave soups, stews, and chili. With a crock pot and crock pot cookbook in hand, I made two chilis — one last month, and one tonight (I know, it’s like I’m blogging in real time!). Both recipes came from the Rival Crock Pot cookbook, which I got for a bargain price of $6.99 at Ross last year. The first chili is called Mama’s Beer Chili. It was actually the second time I had made it; the first time was for the Election Night party last year, where we debated whether this was called chili or Brunswick stew. Whatever it’s called, I love this recipe because it contains corn and beer, and has lots of flavor and plenty of heat. The recipe claims that it takes 20 minutes to prep everything for the slow cooking, but I think it takes more like 30 minutes. This batch was made with Trader Joe’s Seasonal Ale, a really dark beer with lots of flavor. The recipe below is essentially the directly from the cookbook except that I’ve halved the honey. 1. Heat oil in large pan. Add onion; cook for 3 minutes on medium heat. Add garlic and cook for another minute. 2. Add turkey. Cook until turkey is no longer pink. Drain fat. 3. Add remaining ingredients and stir until mixed. Transfer to crock pot. Cook on low 8-10 hours or high for 4-6 hours. Mama's Beer Chili, after, with cornbread. The second recipe, a far simpler one, is for Three-Bean Turkey Chili. Lots of can-opening, very little prep. But the pay off isn’t as good. I had to modify this recipe a little more, adding some spice (Sriracha! ), salt, and pepper. Simple changes, but made the chili much tastier. Turkey three bean chili, before. Love the colors of the beans. 1. Cook and stir turkey and onion over medium high heat until turkey is no longer pink. Drain, discard fat. 2. Transfer to crock pot. 3. Add remaining ingredients. Mix well. Cover and cook for 6-8 hours on high. Turkey three bean chili, after. For both chilis, I made cornbread using the Trader Joe’s Cornbread Mix. It was pretty good, and very easy. All you need is egg, oil, and milk, though I substituted with soy milk and it tasted great. Finally, I don’t know about you, but sometimes I get locked into eating particular foods at particular times. So when JA suggested putting chili on top of our egg sandwiches for breakfast, I was like, WHOA. It was a great idea and definitely made breakfast a lot more interesting, not to mention delicious. The chili + egg open-faced breakfast sandwich. Categories: cooking, photos | Tags: chili, cornbread, crock pot, recipes, Trader Joe's | Permalink. I knew that no matter what happened, I wanted to watch the election returns with like-minded friends. So I convinced (i.e. coerced) JY to have a small gathering because he has cable and I don’t. In exchange, I offered to provide food and beverage in the “Blue” theme: chili with blue corn chips and Pabst Blue Ribbon. OK, so the chili is red, but because it was made with veggie meat instead of ground turkey, I’m calling it “blue” in a liberal/hippie-sense. A few sidenotes about the chili. 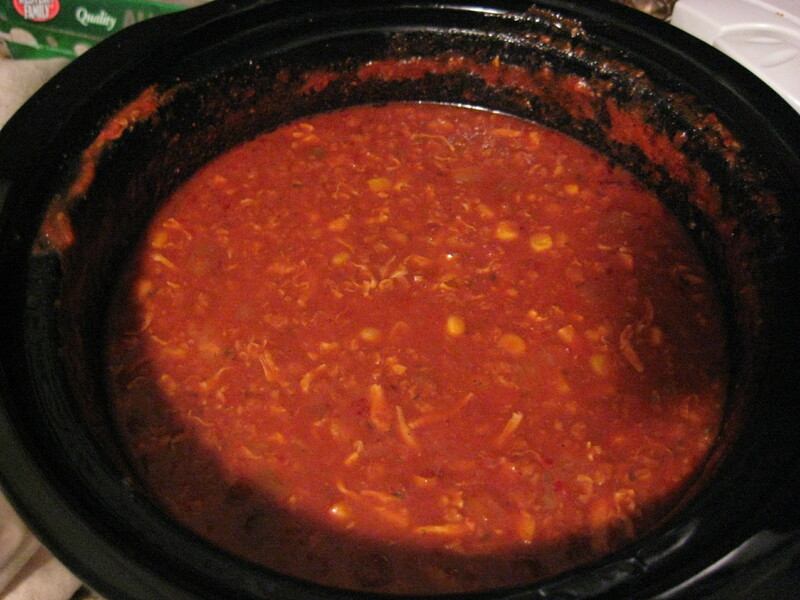 First, JG informed me that the chili was actually Brunswick stew because it had corn in it. Second, it was made in a crock pot that I inherited from JG and AW after they got a new one as a wedding gift (Thanks, guys!). It was the first time I used it and it worked pretty well, except that I left it on too long and it burned the chili later in the evening. Oops. Finally, the best part about making the chili was that the recipe called for one glass of beer. I bought a large bottle of Samuel Smith Nut Brown Ale and poured one cup into the chili and the rest into a pint glass. What else to do but drink it? Back to the election night story. 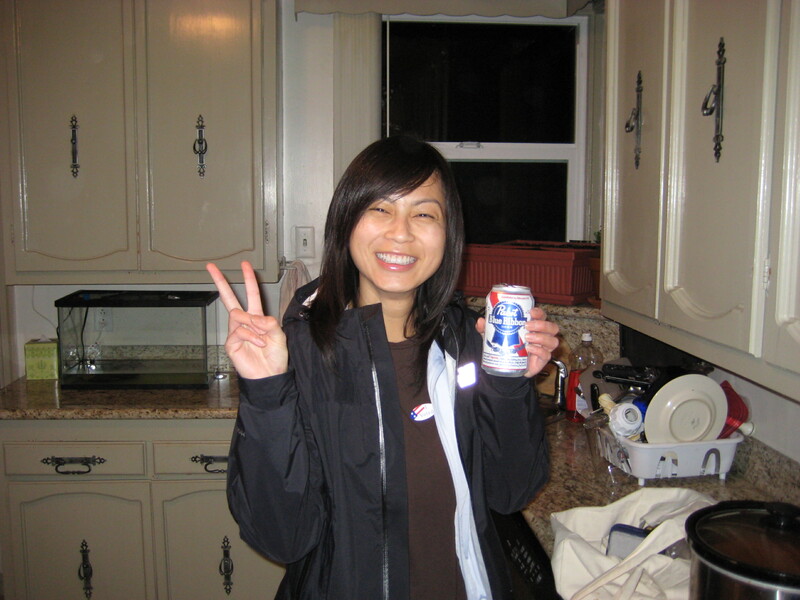 By the time I got to JY’s house, all of the networks had called Ohio for Obama, so an Obama victory was almost inevitable. I breathed a sigh of relief and tried to take in the historic moment. 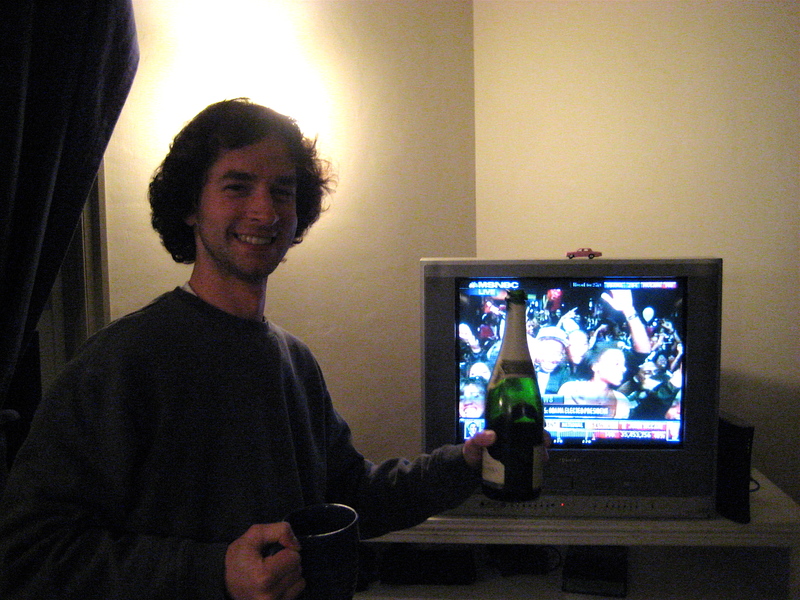 B, with great foresight, brought a bottle of champagne which we opened as soon as Obama captured over 270 electoral votes. What an amazing night. Yay for President-elect Obama! "I will use this BLUE chip to eat you, RED salsa!" Beer chili or Brunswick stew. Whatever you call it, it's delicious! Celebrating an historic moment with bubbly. Categories: cooking, photos | Tags: chili, cooking, crock pot, photos (drink), photos (food), photos (me), politics | Permalink.